They autographed baseball caps emblazoned with “Donald & Shinzo.” They played nine holes of golf with a Japanese sensation often compared to Tiger Woods and didn’t keep score. They shared an intimate dinner and repeatedly showered each other with praise. 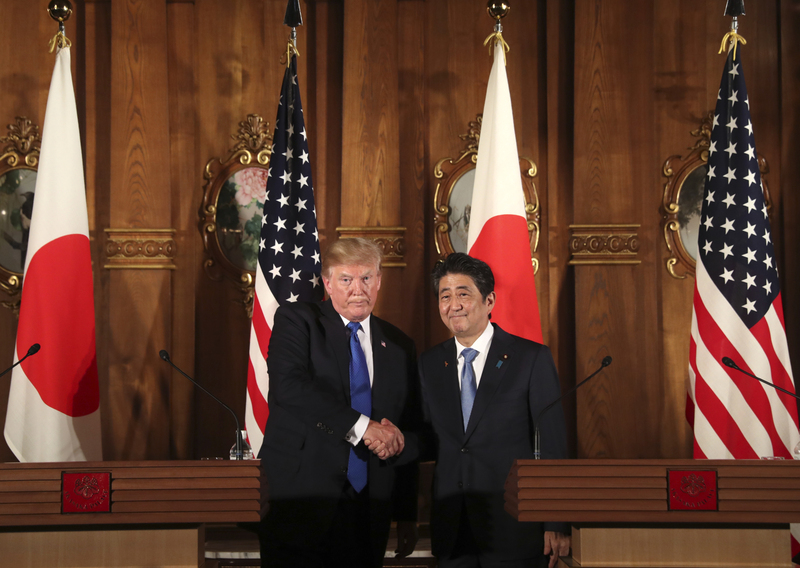 But for all the apparent chumminess between President Donald Trump and Prime Minister Shinzo Abe, it hasn’t resulted in much concrete action to address Trump’s main complaint: fixing what he sees as an unfair trade relationship with Japan. For Trump, more known for shoving a fellow leader aside than embracing one, the relationship with Abe is a way to show he can work with his peers around the globe. The two men also agree on a hard-line approach to North Korea. But throughout Trump’s two-day visit, Abe publicly ducked any talk of major trade concessions even though Trump kept bringing it up. The only major investment cited — a $1 billion project in Tennessee from auto parts maker Denso Corp. — was old news, contrasting with Trump’s plan to announce billions of dollars in deals on his stop in China later this week. Trump all but pleaded with Japanese carmakers to build more factories in the U.S., or let a few more American cars into Japan. Invest in the U.S., Trump said, and he promised to make sure they speed right through the approval process. Yet Abe’s deflections showed Trump that it won’t be that easy to narrow the $69 billion trade deficit with Japan, driven largely by U.S. imports of cars and electronics. 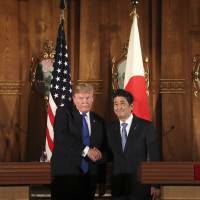 One major problem for Abe is that he’s not sure what exactly the U.S. wants, according to Hiroyuki Kishi, a professor at Keio University and a former trade ministry bureaucrat. On autos, for example, Japanese officials argue the market isn’t closed to American cars — consumers just don’t want to buy them. For the U.S., the Japanese trade deficit is second only to that with China. Trump has made clear that he tends to see the numbers as a sort of fairness scorecard, and any figure with a minus for the U.S. almost automatically means the other side is somehow breaking the rules. “Right now our trade with Japan is not fair and it isn’t open,” Trump told business leaders in Tokyo on Monday. But Abe hasn’t forgotten that it was Trump who pulled out of the 12-nation Trans-Pacific Partnership, a move the U.S. president once again defended Monday. Abe spent significant political capital to back the trade pact, particularly among farmers who don’t want to see tariffs on agriculture lowered. Japanese officials also say the TPP would have helped narrow the trade gap. Japan hasn’t ruled out the sort of bilateral partnership with the U.S. that Trump seeks but is spending most of its energy on a process known as “TPP 11” — an attempt to keep the framework intact without the U.S. Abe is also reluctant to put Japan’s highly protected agriculture sector further at risk in a bilateral deal. Still, the White House is eager to find ways to loosen barriers to exporting American agriculture and livestock. U.S. producers are concerned they’re losing market share, and would like reduced tariffs on beef, pork, dairy, fruit and vegetables, among other foods. Japan is eager to leave the trade talks to Vice President Mike Pence and Deputy Prime Minister Taro Aso, a formulation that allows Trump and Abe to focus primarily on defense. Pence has urged Japan to roll back its emergency import restrictions on U.S. frozen beef, which saw tariffs rise to 50 percent from 38.5 percent. That’s led to a monthly drop in U.S. frozen beef exports. The Trump administration also wants Japan to expand its use of U.S. liquefied natural gas, hoping exports could cut into the trade deficit. Gary Cohn, the president’s top economic adviser, has voiced support for a terminal in the U.S. Northwest that would send tankers full of LNG to Asia. The White House is also hopeful that it can boost ties between the countries’ transportation sectors by coordinating infrastructure development and maintenance projects. Trump on Monday talked up recent Japanese purchases of defensive military equipment designed to blunt the threat of North Korea’s nuclear program. Abe listed several missile defense systems Japan is planning to buy as well as Lockheed Martin Corp.’s F-35A fighter jets. Yet all the deals had previously been announced. For Trump, one key accomplishment was showing a united front with Japan on North Korea. On trade, Trump took what he could get, even if he is largely leaving Japan empty-handed. And while he called Abe a “very tough negotiator,” he also talked up perceived outcomes at every opportunity.